Born in Yokohama in 1978, Yusuke KOZAKI is a rising star in Japan's pop culture scene. At 19 he won the prize of honor as Manga young talent in the 215th edition of the contest organized by Young Magazine. Next, he won the 40th Chiba Tetsuya Award. Shortly thereafter his first short story "Mikakunin Higoshojo Kaoru" was published in Young Magazine. In 2002, his first long form story "Kyoko Karasuma" was published in the magazine B-Street. He is currently working on Donyatsu. In addition to being a talented manga-ka, Yusuke KOZAKI has diversified his talents by becoming a character design for anime. 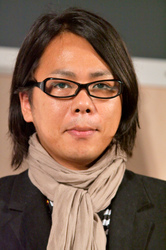 His talents brought him acclaim for his work on the anime Speed Grapher, and shortly thereafter Sunrise Studios entrusted him with character design for the anime Bakumatsu Kikansetsu Irohanihoheto. Not content to limit himself to manga and anime, Yusuke KOZAKI has worked extensively in video games as well. His work can be seen in titles such as Osu! Tatakae! Oendan, Lord of Vermilion and of course the popular No More Heroes series which has been released for Wii, Playstation, and Xbox 360. His most recent efforts as the character designer for Fire Emblem Awakening have been extremely well received, and the game has enjoyed excellent reviews and sales.